After backtracking your way out of the Sunless Citadel and making camp up on the grass overlooking the chasm, you get a reasonably good amount of sleep. There's a light rain in the early morning. If you hunt for food, you're able to find some small game. If you search for some berries or plants to eat, they're not far. If you wish to spend enough time to heal to full hit points here, that's perfectly fine. Nothing will come up out of the citadel after you at this point. You do realize that the kobolds owe you a debt for rescuing the wyrmling. And of course, your job to find the brother and sister is still outstanding. But isn't it a lovely day out here, under the sun? After a day of rest I am fully healed and eager to return to the Citadel. If Laughing Crane is in need of more time to fully heal up, I'll patiently wait it out. I'm not much of a hunter but I can gather berries and plants to fortify our rations. "Laughing Crane, we should seek out the kobolds and learn what we can from them." I poke a stick into the camp fire and smoke and cinders billow out. "I don't truest Yusdrayl but I think returning the dragon to Meepo earned us his... trust. We might learn something of worth from them. If we are to find the kids alive sooner is better than later." After eating, I do my morning stretches and a few sword practice forms. "Agreed. Hopeful the tale of our strength will impress Yusdrayl enough that she will not try to betray us. She may even help us, but I think you're right about Meepo. Once more into the Citadel!" Unless Ba has other ideas, I will head for the Kobold area. While Laughing Crane does his forms I'll pack up our camp. We return back to the Citadel for more exciting adventures! You head back into the Citadel, retracing your steps until you reach Yusdrayl and her small retinue (in room 21 below). Yusdrayl inclines her head in respect, "Welcome back, humies. Meepo feared that you died covering his escape." She peers down at you, her talons clicking on her throne, "I offered a reward of information on your humie friends, but Ashardalon did not grant it to you, it seems. However, the Great Dragon works in mysterious ways. Soon after Meepo returned, a band of goblins encroached our territory seeking to retrieve the dragon again, but we defeated them. After... some work on one of their survivors, she admitted that they have humie captives, and have been sending ransom notes to the closest humie town." "Does the great and generous Yusdrayl know where we could find the humie captives?" Yusdrayl looks down at you, Laughing Crane, eating this stuff up. It's obvious that your respect, whether real or feigned, is the kind of stuff she craves. "I have bargained for the release of some of my tribe in the past. They were kept in a room not far from where Meepo led you. In the chamber that is a twin of this one here (Room 39), there is a door to the south. This is where they were held. Your humies should be there." "We were so close!" I gasp. I give Yusdrayl a slight bow at neck level. "Let's return to the northern rooms, Laughing Crane." I am not convinced we are allies but it is a small gesture of courtesy. I feel certain Laughing Crane will keep up his grand performance. Once he has shown his gratitude we move quickly back to the goblin's side of these ruins. So we're clear, time has passed, the goblins will have tried to prop up defenses in the room's they've previously occupied. Let's walk through that to see how things work out. "Thank you you worhipfulness. We shall remember your graciousness and mightly leadership!" I bow and back out. 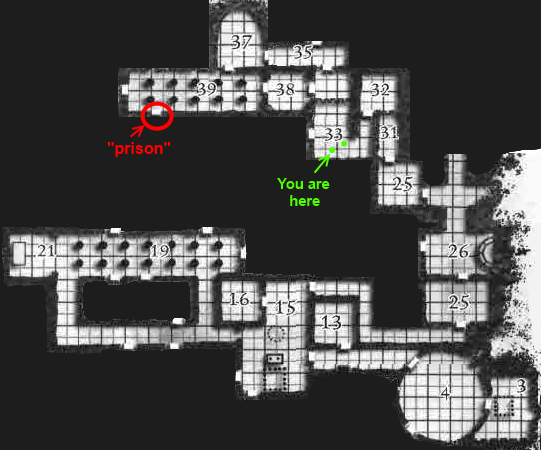 You're able to leave the kobold area and head the the empty room (25). You know there is a bell contraption on the other side of the door, Ba. You can disable it again without a roll. After listening to the door for a couple minutes, you're able to hear goblins talking on the other side. They sound more alert than before. Evidently the beating they received recently put them on high alert. If you want to try and sneak in, I'm going to say this is an Average (11) difficulty task. Success gives you a surprise round on the goblins (there are five of them crammed in there). If you'd rather just charge, you'll get initiative, so go ahead and roll attacks, but then they will react in that round. As I crouch next to the door finishing the disarmament of the alarm, I motion to laughing Crane that there are goblins on the other side. "We should sneak in," I whisper. I draw and set my hook sword. I change up my crouching stance. My sword in my left hand I slowly inch the door open so that we can slide into the room. Ba, you gently release the cord on the bell alarm like before, then creep in, moving low. Laughing Crane follows you, moving slower, trying to compensate his lack of skill by taking extra measures. However, just through bad luck more than anything else, one of the goblins stands up to scratch his back, facing the pair of you right as you're about to charge. He's partially protected by that half wall, but he sees you both. He lets out a surprised, "Urk!" then starts reaching for a weapon. The other four goblins are scrambling to mount a defense as well. One of them has a wicked looking crossbow, he's got his back against the far wall. You guys have initiative, so let's see what happens. I almost made past the bell. If I had just not over-extended on the second to last step. "gou pi!" I curse under my breath. I scream "By the Seven Gods and 42 Heroes! Attack!" and charge right into the midst of them. Fu xia Mei teaches that once stealth fails, overawe your opponent. So that's what I'm trying. In my exuberance, I actually startle the first goblin so much that he leaps out of my way. My sword whizzing through the space where his gut was. Following through with a spin and a kick, though, I take out the two standing behind him. "Gyaaaah" I growl as the goblin calls out and laughing Crane dashes past me towards the goblins. I hurry to stay a few steps behind him as he plunges into their midst like a crashing wave. The first goblin that Laughing Crane swiped at is quick. He nimbly sidesteps my thrust, too. However, I twist my blade and pull back. It slices deeply into the soft, pale green flesh just above his belt. The axes he was holding clatter to the ground as he clutches his side. Black ichor spills out between his fingers as he attempts to hold himself together and stop his insides from leaking. I swing my sword overhead with both hands. "By Sri, I deliver you back into the darkness!" Crashing down, my sword''s edge bites deep into his neck and ends his misery quickly. The two remaining goblins, one with arms like a gorilla and a pair of carving knives stolen from a set off a tinker's wagon, the other with his wicked crossbow still moving back, planning on firing, then running, make their attacks. Gorilla-armed goblin makes a couple feeble swipes, but even with his reach, he isn't able to connect. Crossbow goblin moves south into room 33, yelling and trying desperately to reload. You can hear more goblins behind them in the next room. Surely they can't have an inexhaustible supply... right? As I attack gorilla-arms, I yell at Ba, "How many goblins usually make a tribe, or nest, or, squalor, or whatever a group of goblins is called?" This question is punctuated with sword swipes, blows from my buckler and kicks to the goblin. Perhaps laughing Crane's question was meant more of a warning. "I don't know... twenty? "I guess as I rush past him. I'm chasing after the goblin fleeing into the other room. However, I know we need end this quick so I'll throw a dagger at him as I run after him. Ba, you dispatch the crossbow goblin after rushing him, then tripping him with the hook sword. He fell back, pitifully raising his arms up in a feeble attempt to stop the chopping motion from your follow-through. Both of you made it into room 33. As a reminder, here's where you've been, and where you're headed. You hear goblins chattering back and forth from a couple rooms away, but they aren't charging in. Not yet. Seems like they're waiting for something. Could be setting up a trap. I plant my foot on the goblin's chest and pry loose my sword and catch my breath. The muffled sounds of the goblins cause the hairs on the back of my neck to stand up. "I've a bad feeling about this, my friend," I say, hoping that he will suggest otherwise. I'll pick up the crossbow and whatever bolts. I quietly walk over to the southernmost western door, the one we did examine last time we were in here. I'll crouch low and listen for a minute. Are there any sounds from the otherside? Or cracks in the door or lock I can peer through? Ba, the southernmost western door in Room 33 leads to Room 34. The wooden door is closed and locked. "Let us out. It's Dogget." "I think Meepo's brothers are in this room," I say to Laughing Crane. I sheath my sword and pull out my lockpick tools. "We have rescued Calcyrx and are friends to your brother, Meepo." I say through the door. "Keep quiet. We can let you free." I'll set to opening the lock.